If you’ve followed my blog for a while or made any recipes from my eCookbooks, you know that I always recommend Bob’s Red Mill flour – it’s my favorite gluten-free flour brand! Their gluten-free all-purpose flour is incredible for substituting 1 for 1 in any recipe that calls for regular wheat flour. 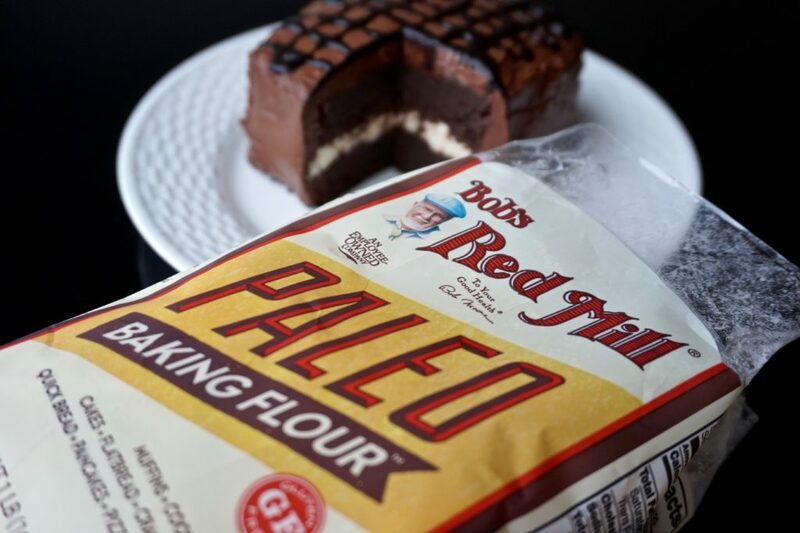 I was so excited when I found out Bob’s Red Mill came out with an all-purpose Paleo Baking Flour. Paleo = grain-free, so it’s naturally lower in carbs than regular flour. 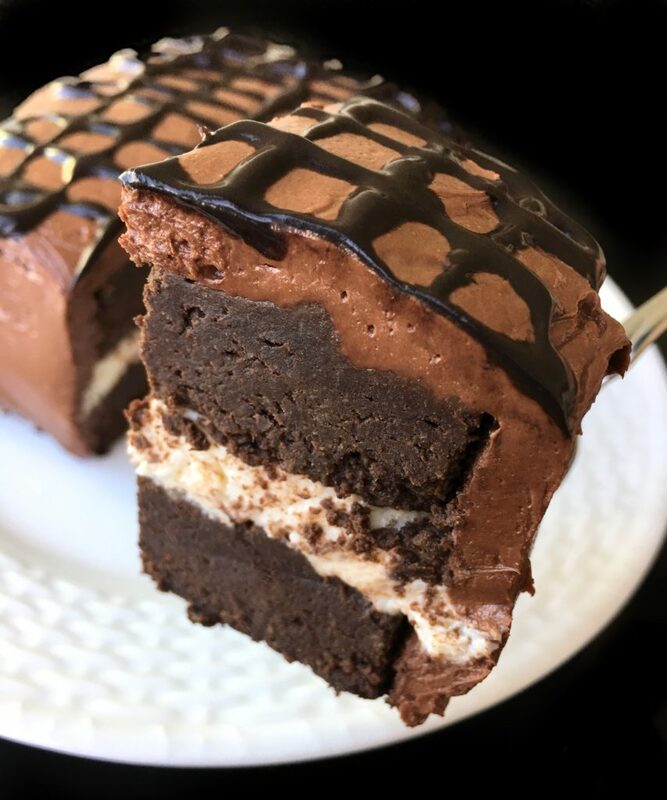 I came up with this UNREAL Paleo Chocolate Fudge Cake recipe using the new paleo flour. This recipe is SO EASY. It takes just a few minutes and one bowl to mix all the ingredients together. Give it a try, and let me know what you think! Add maple syrup, sweet potato, and egg, and stir until combined. Batter will be very thick and sticky. Bake for 17-20 minutes. 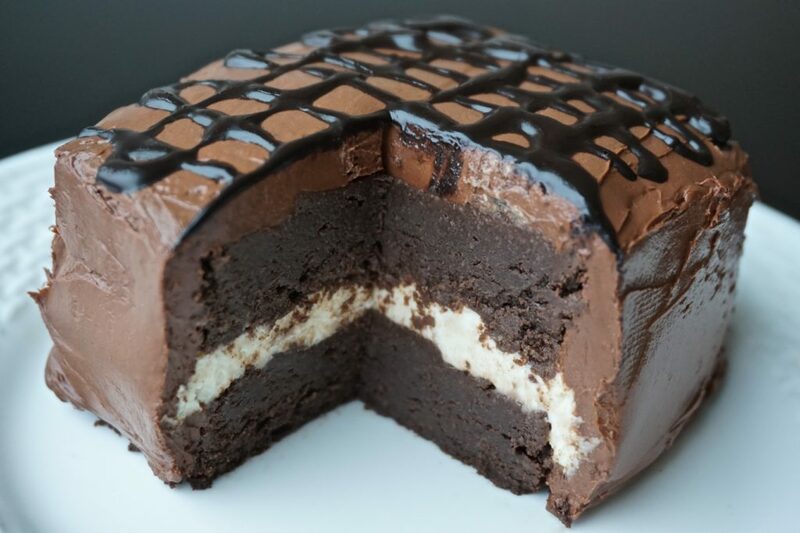 Allow to cool completely before slicing and serving. 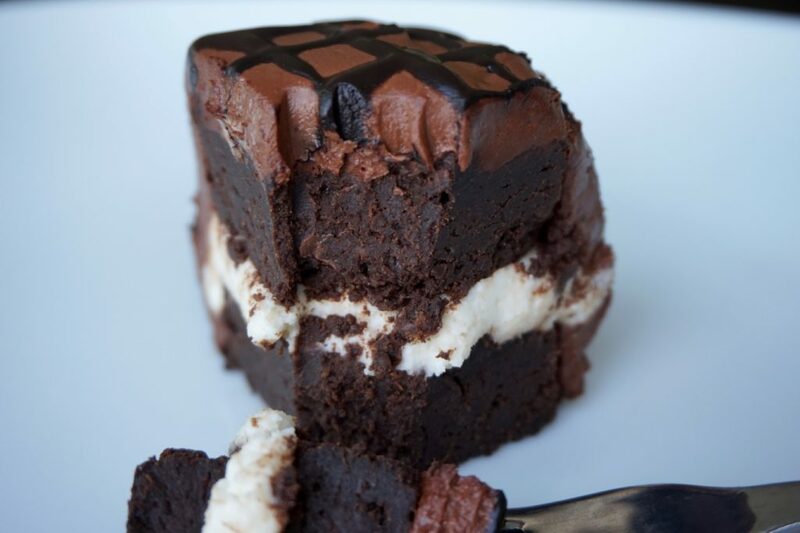 Enjoy immediately after cooling for a melt-in-your-mouth, lighter texture, or refrigerate for a few hours before serving for a denser, fudge-like texture (pictured). Either way, it’s amazing! I made two double layer cakes (6 servings each) by cutting the 8×8 square into 4 pieces and layering two quarters on top of each other. This recipe can also be enjoyed in one layer, cut into squares! Tip: hover cursor over any photo, or tap photos on mobile to pin this recipe to Pinterest! *you may also try using Bob’s Red Mill 1 for 1 all-purpose gluten-free flour, gluten-free oat flour, almond flour, etc. **coconut palm sugar, cane sugar, or any other granulated sweetener can be substituted, but this may affect the carb/sugar content. Thank you to Bob’s Red Mill for sponsoring this post. I am so lucky to work with brands I truly love and personally use! 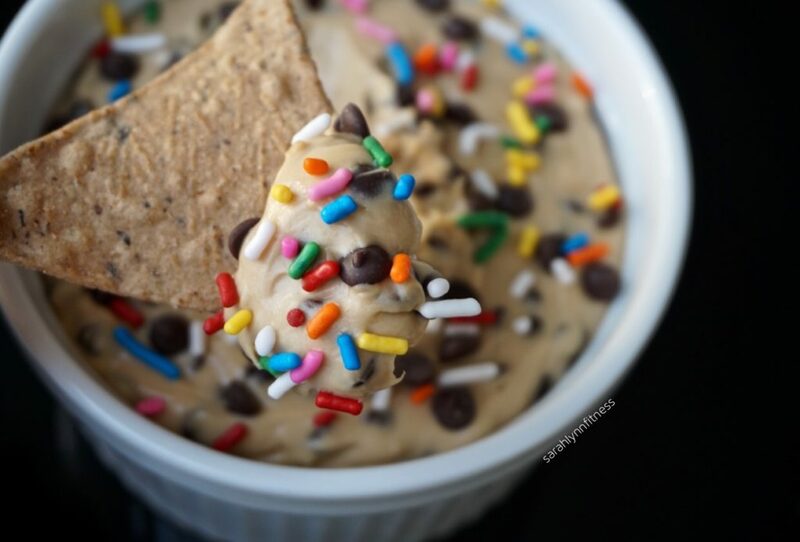 Move over guac, salsa, and ranch… cheesecake cookie dough dip is here! 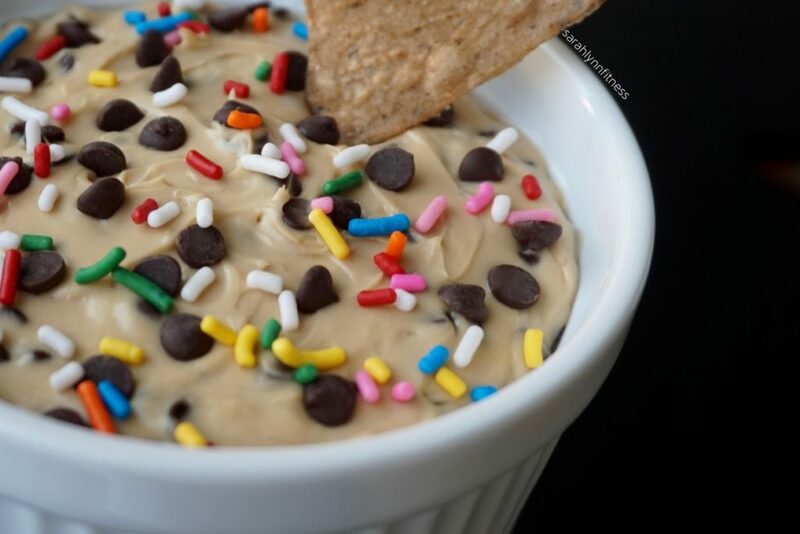 Bring this heavenly dessert dip to your next party, make it for Valentine’s Day, or simply enjoy anytime the cookie dough craving strikes. 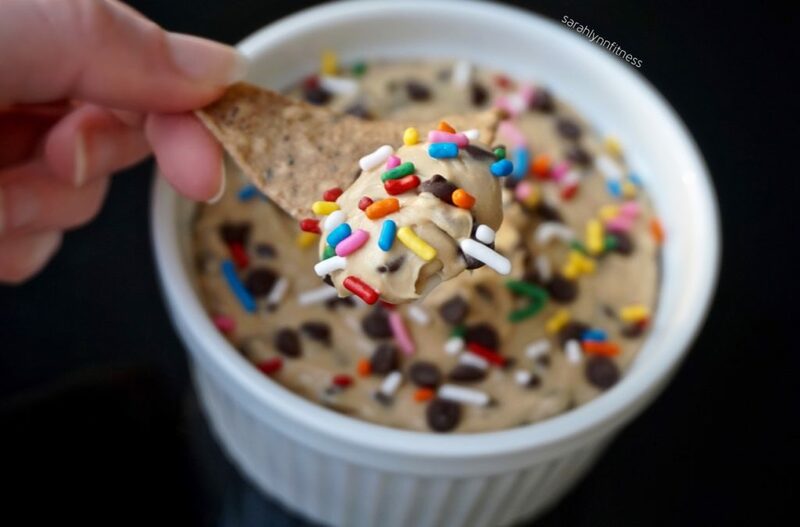 There is never a wrong time for cookie dough dip! I enjoyed it dunkaroo style (who remembers dunkaroos?! hiii 90’s babies) with iwon organics protein chips in both the cinnamon french toast and sea salt flavors. iwon protein chips are vegan, gluten-free chips that are EVERYTHING a chip should be – flavorful, crunchy, satisfying – yet they pack 12g of plant-based protein per serving. 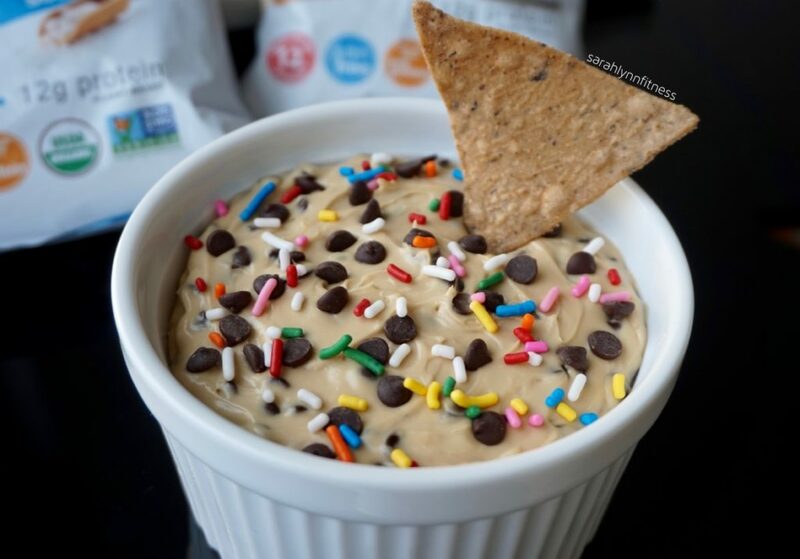 This dip is gluten-free, vegan-friendly, and has so many fun variations and possibilities! In a bowl with electric mixer, mix cream cheese and ghee/butter until combined. Add coconut sugar, vanilla, and salt, and mix until very smooth. If adding protein powder or nut butter (optional add-ins), add those and mix again until smooth. Spoon mixture into a serving bowl, and serve with iwon organics cinnamon french toast or sea salt protein chips! If a thicker texture is desired, refrigerate for an hour or two before serving. **I recommend collagen protein for this recipe because it does not change the taste or texture. The recipe will not be vegan if collagen is used, but I love collagen protein for hair, nail, and joint health! Using whey or vegan protein will change the taste and texture of this recipe, so I cannot guarantee the results if those are added. Enjoy! Post a photo on Instagram and use #baketobefit if you try this recipe. Also, let me know what you think if you try iwon organics protein chips and crackers! You can order online on their site, or check out where to buy for where to find them in stores. For tons more healthy dessert recipes, check out the eBooks available here. Thank you to iwon organics for sponsoring this post. I only work with brands I truly love and personally use. This post does not contain any affiliate links. Everyone knows that gluten-free breads can be unenjoyable to say the least. Many people who need to follow a gluten-free diet give up on eating bread altogether due to the lack of good options. Luckily Canyon Bakehouse (my favorite gluten-free bread company) is now widely available, so no one had to suffer with less-than-delicious bread! Their bread is soft, toasts wonderfully, and they even have bagels, hamburger buns, and other fun bread products. This healthy Brownie Batter Frosting changes everything. It’s rich and chocolatey enough to satisfy the most intense cravings, all while being refined sugar-free and vegan. 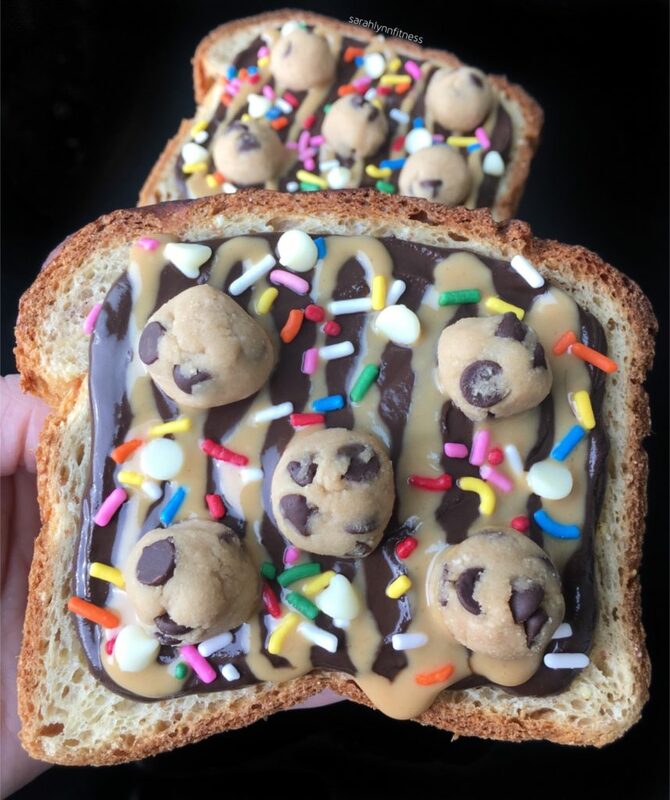 Topping it with edible, gluten-free cookie dough and a drizzle of organic peanut butter was the perfect combination for this delicious DESSERT TOAST! Divide frosting evenly between pieces of bread and spread into an even layer. 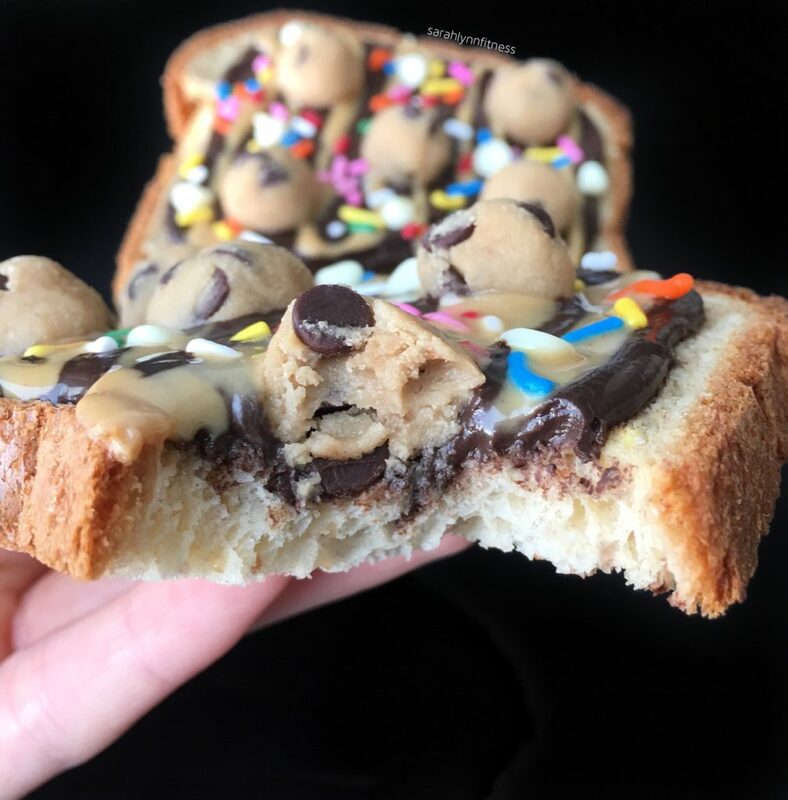 Drizzle 1 teaspoon of peanut butter and place 5 cookie dough pieces on each slice of bread. Toast in a toaster oven after adding toppings (recommended) for a melty, chocolatey treat. The frosting will not melt off, the cookie dough will cook slightly into half-baked cookies, SO GOOD! Mix cocoa, powdered peanut butter, and stevia in a small bowl. Add maple syrup, then add almond milk slowly until a thick frosting texture is reached. Add coconut oil, almond milk, and vanilla. Slowly add additional almond milk 1 teaspoon at a time if needed to reach a thick cookie dough texture. Form into about 20 small balls. For tons more healthy dessert recipes, check out my four eBooks available here. Thank you to Canyon Gluten-Free Bakehouse for sponsoring this post. I only work with brands I truly love and personally use. All opinions are my own. 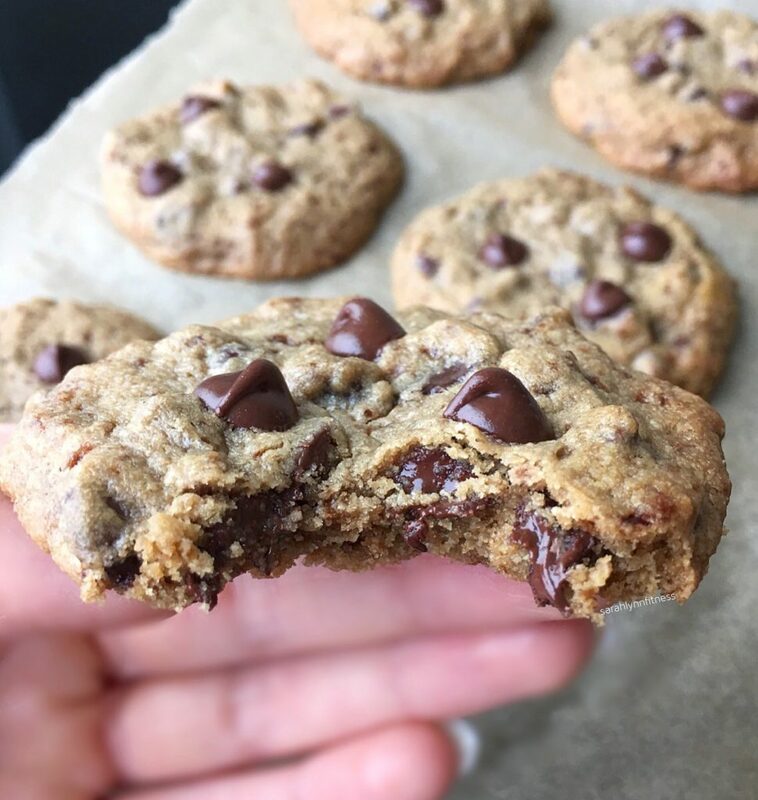 Finally an easy gluten-free cookie recipe that has the traditional Toll House cookie texture & flavor: crispy on the edges, soft and chewy in the middle. I love that this recipe only requires one type of flour. It works great with either gluten-free all purpose flour or gluten-free oat flour! This recipe makes two dozen large cookies. Preheat oven to 350 F. Combine coconut oil or ghee, coconut sugar, maple syrup, vanilla, and egg in a large bowl. Combine oat flour, baking soda, and salt in a separate bowl. Add dry ingredients into the wet ingredients, and stir until a thick dough forms. Fold in chocolate chips. Line a cookie sheet with parchment paper. Form dough into 1.5 inch balls and place about 2 inches apart (they will spread). I recommend baking 12 cookies at a time and baking in two separate batches. Bake for 7-9 minutes. Allow to cool, and enjoy! Tap the photo or hover your cursor to save this recipe to Pinterest! Check out all of the eBooks here for tons more healthy dessert recipes! There is nothing better than the smell of banana bread baking in the oven. This banana bread is just as buttery, soft, sweet, and delicious as your favorite traditional banana bread – except it’s gluten-free, refined sugar-free, vegan-friendly, and low in carbs and calories! Including the cinnamon streusel topping, each slice is only 72 calories and contains less than 4g of sugar. This recipe, along with all my other blog + YouTube channel recipes, as well as a ton of NEW never-before-seen recipes are included in the new eBook: The Healthy Brownie Cookbook, available now! Preheat oven to 350 F. Add all dry banana bread ingredients to a large bowl and stir well. Add mashed banana, almond milk, vanilla extract, and butter or oil. Stir just until combined – do not overmix. Line two mini* loaf pans with parchment paper or spray with nonstick spray. Divide batter evenly between the two pans. Combine all streusel ingredients in a small bowl and mix until a crumbly texture is achieved. Divide streusel on top of the two loaves. Bake for 30-35 minutes. *Note: you may also bake this recipe in one regular size loaf pan, but keep in mind you may need to increase the baking time. *Protein powder: I have tested this recipe with both Slap Nutrition whey protein powder and Yep, It’s Vegan protein powder. 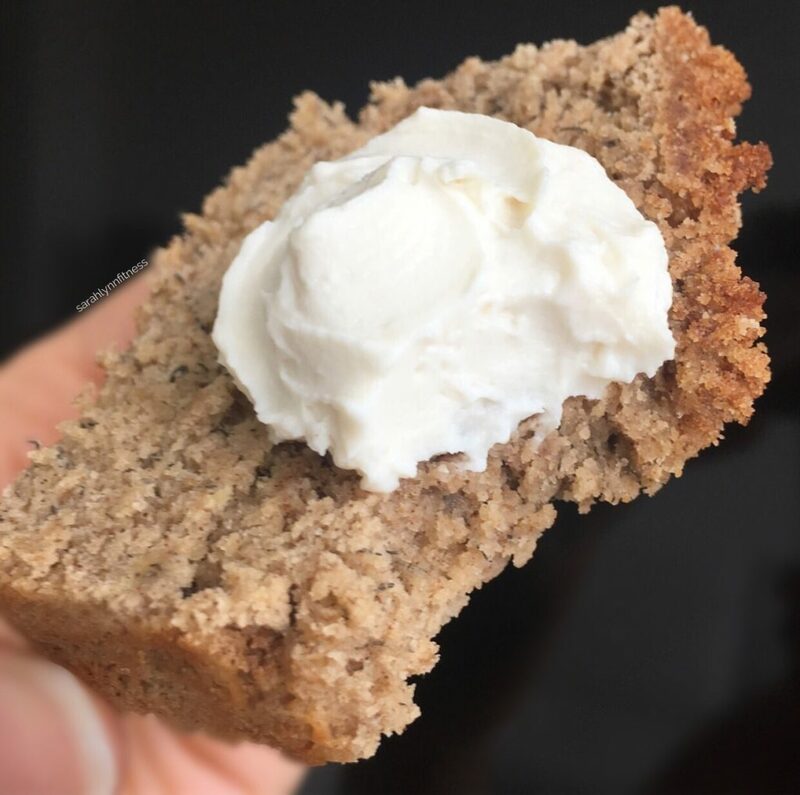 The vegan protein powder will result in a slightly denser (but still incredibly delicious) banana bread, while the whey protein results in a more traditional banana bread texture. If using the vegan protein, you may need to add a few extra tablespoons of almond milk, as the vegan protein absorbs more liquid. You can use the discount code SARAH for 10% off any Slap Nutrition or Yep, It’s Vegan products. 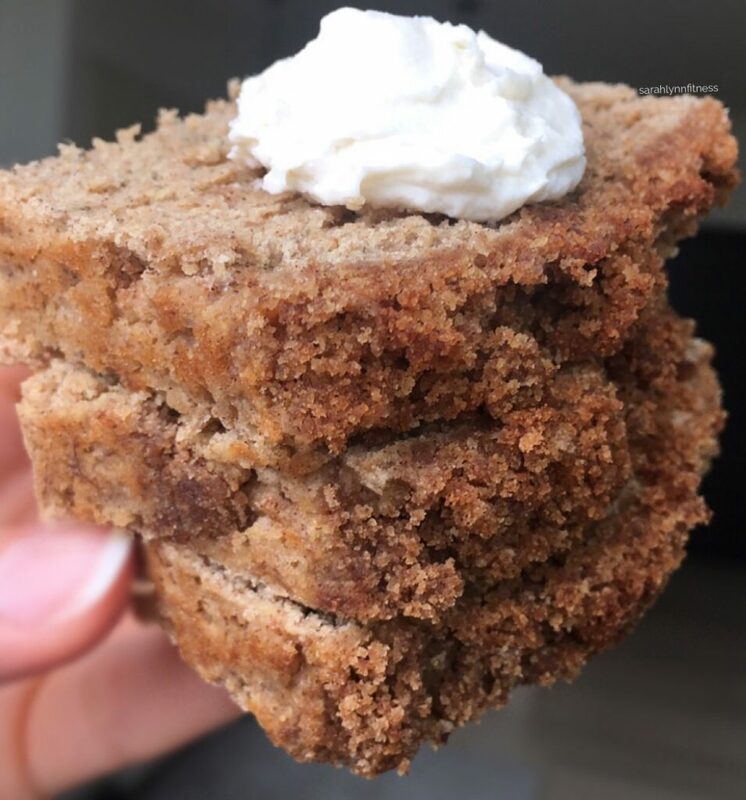 If you try this recipe, post a photo and tag me on Instagram @sarahlynnfitness @baketobefit, and use the hashtag #baketobefit – I’d absolutely love to see, and may share your photo!